This is an article pertaining to time. If you are interested in numbers, you may be looking for 0 (number) or Interstate 0. Represented here are the time periods from 0BC to 0AD. 0 B.C. - 0 A.D. (P.C. 0 B.C.E. - 0 C.E.) covers the era between the end of the second following 11:59:59 p.m. December 31, 1 B.C. and precisely midnight January 1, 1 A.D. This infintesimal time period was among the most joyous of moments in history, as people of all ethnicities, creeds, and sobriety levels experienced a unified euphoric harmony, simultaneously holding their breath in preperation for the exclamation, "Happy New Era!" or, among Christians, "Happy Circumcision, Jesus!" or possibly, "For God's sake, don't let the knife slip!" 3 0 B.C. to 0 A.D. Unfortunately for the Greeks, the Romans had similar ideas. But they knew about the Y0K problem. A true politician, Augustus Caesar tried to postpone dealing with the problem by adding a month to each calendar year (in his own name, of course). An even truer politician, Julius Caesar did the same, but after 0 A.D., thus postponing a problem that had already been solved, while ensuring his own glory would not be eclipsed by Augustus. To that end, he made sure July would always come before August. 0 B.C. to 0 A.D.
Christian theology places the beginning of the new era at the eighth day after December 25, 1 B.C., the date on which Christ would have been circumcized. The knife apparently didn't slip, otherwise Jesus would have been raised a girl. Or else it did, and they covered it up, which might explain the loincloth on the crucifix. A few days after His birth on December 25, 1 B.C., Jesus offered His Own solution to the problem Aristotle had discovered 360 years earlier. Christ suggested adding two years to the calendar, 0 B.C. and 0 A.D. (which, in His Divine Humility, He did not insist on putting in His Own Name), which would reset the numbering of years so they would ascend rather than descend. Placing the two years at the moment of His circumcision meant He would have to endure two years of penal torture. The Lord was pleased with Christ's sacrifice (in fact, He was damned impressed), and agreed to spare humankind from temporal ruin. 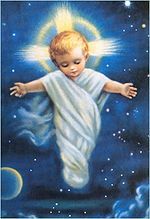 Thus the baby Jesus became the saviour of the human race. Jesus at 12:01 a.m., January 1 of the new era. Notice the crucifix pose. March 25, 1 B.C. - The Immaculate Conception. So immaculate Joseph didn't even have to clean up. December 23, 1 B.C. - Mary goes into labour. But it was an immaculate labour, so it didn't really hurt. December 25, 1 B.C. - Birth of Christ (OK, it was probably really in April, but that would ruin the chronology). December 28, 1 B.C. - With time running out and humankind panicking, Jesus makes the supreme sacrifice. Infintesimal moment before midnight, December 31, 1 B.C. January 1, 0 A.D. to December 31, 0 A.D. - occurred simultaneously with 0 B.C. Midnight, January 1, 1 A.D. - the human race lets out a collective sigh of relief. So does the baby Jesus. This page was last edited on 2 December 2011, at 03:28.